We had traveled from Trivandrum to Ernakulam by train (Jan Shatabdi Express - read about that here), and then headed for a sumptuous breakfast at Hotel Dwaraka. Dwaraka is an old property, and has a fairly good vegetarian restaurant - that serves delicious dosas! After the breakfast, we hired an Ola to head to the airport - the 37 kilometre ride to the airport from MG road took a little over an hour. We reached the airport a little past 1210hrs. There was a fairly long queue to get into the terminal - all thanks to slow document verification at the entry point, and absence of sufficient guards. Once inside the terminal, it took more time to finish baggage screening - the domestic terminal at Kochi (aka Terminal 2) doesn't have inline screening, and passengers need to get their bags screened before check-in. The present terminal is due to the shut soon, and the former International terminal (aka Terminal 1) will take over as the domestic terminal by the end of 2017. The added burden of having to get bags screened in only until then. The present domestic terminal is a mess - the number of domestic fliers out of COK has been burgeoning year on year. The terminal is now packed to capacity and the waiting area gets packed to the core during peak hours. Check-in was breeze - we got seats in a row. Although we requested for two windows, it seems the flight was full, and we had to make with one window, one middle and two aisle seats. The check-in agent was very particular about verifying identity proofs of all of us before handing over the boarding passes (1223hrs). The real effect of the crowd was visible at the security check area - the place was chocked, and queues moved slow - real slow. Only three scanners were working, and four queues for frisking were open. We were done with security only by 1233hrs. The security hold was packed - we could find seats strewn here and there - nothing together. The bird after we reached Bengaluru! 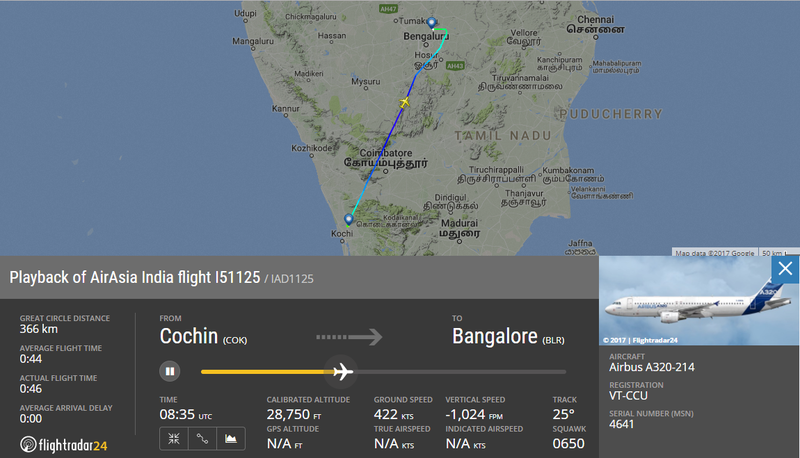 I logged into FlightRadar24 soon after getting a seat - I was super excited to see VT-CCU heading to Kochi as I51124, which would then return as I51125, taking us back to Bengaluru! 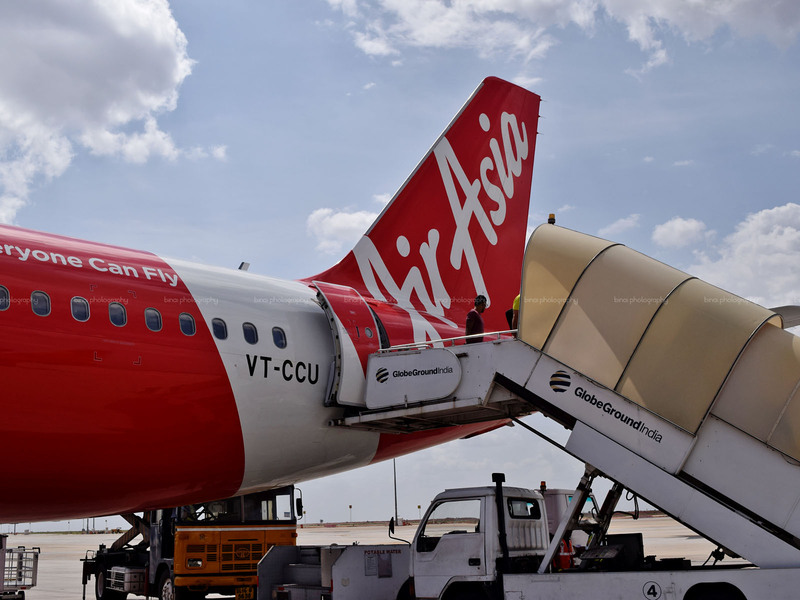 VT-CCU was, then, the 'newest' in AirAsia India's fleet. VT-CCU, cn: 4641, is a 6 year old bird, which was originally delivered to Frontier in March 2011. 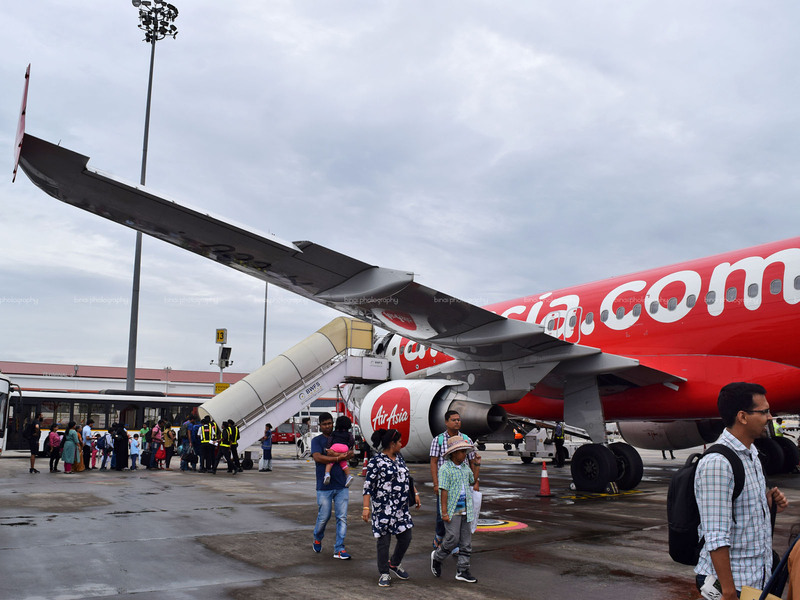 She was delivered to AirAsia India in May 2017 after being refitted to its present 180Y layout. Along with the excitement of being on a new regn, that too a new bird, I was relieved that I wouldn't be repeating a registration! 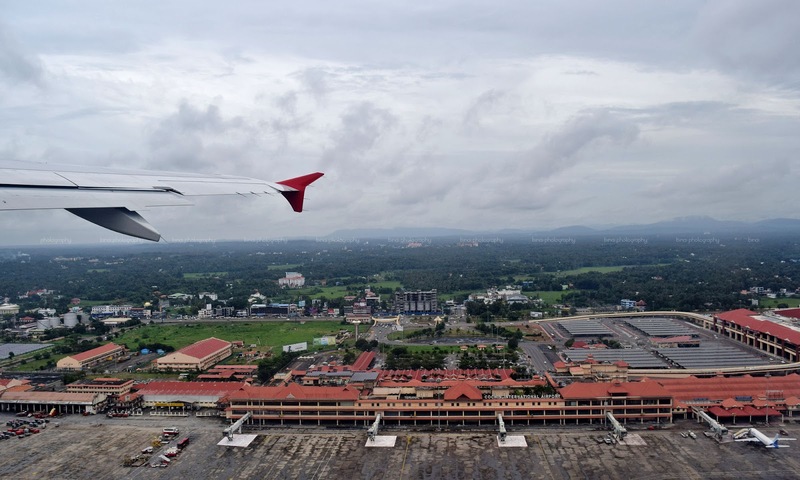 Kochi Airport was at the peak of its peak hour - there were three flights to Bengaluru departing one behind the other, along with flights to Mumbai, Jaipur, Delhi and Ahmedabad! It was a Sunday, and it appeared like all the flights were full! The apron was busy all the time. Our bird came in at around 1300hrs and parked at a very remote bay. The first boarding call was made by 1306hrs. As soon as the gate agent finished making the call, a long queue was already there - enough people to fill two buses! We remained seated till the tail end of the queue reached closer to the gate. We got in to the tarmac coach by 1322hrs. We got to VT-CCU, parked at Stand #13, by 1324hrs. We headed straight to the rear entrance. We were inside the bird by 1326hrs - the FA at the door gave a warm welcome with a nice smile! I was all set for my first ever middle seat flight, as my darling niece grabbed the window seat! We were in Row #28. Boarding was completed by 1330hrs and doors were armed by 1331hrs. Pushback commenced at 1334hrs. In command was Capt. Amandeep - I couldn't get the name of the first officer. Safety demo commenced soon after pushback, and was done by the time we prepared for taxi. Taxi commenced at 1339hrs - we set off on our long journey to the holding point of Runway 27 - some 3 kms away! Boarding VT-Kolkata.. I mean, VT-CCU..
We got to the holding point by 1344hrs - and directly entered the runway for take off. Right behind us was VT-WGD, one of Go Air's 5 A320Neos! We lifted off from Kochi's Runway 27 at 1345hrs. She flew straight to the west, and quickly turned around to set cruise in the north-easterly direction. We climbed quickly. The seatbelt signs were turned off at 1348hrs. Cabin service commenced quickly. I think majority of the pax on board had prebooked their meals - the cabin filled with the smell of hot food in no time - I found it really hard to survive the smell of food. I kept distracting my thoughts by reading the travel 3Sixty magazine and playing with my niece - who was excited about flying. 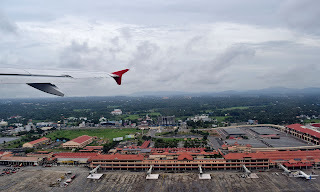 Taking off from Kochi.. Thats the terminal buildings.. The flight was largely uneventful. The seatbelt sign was back on at 1410hrs, and we prepared for landing. The captain had come on the PA system and brief passengers about the flight - the weather seemed really good. Bangalore was hotter than usual - and we had clear skies. 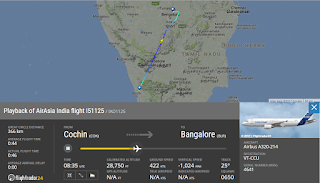 We finally touched down at 1424hrs, on Bengaluru's runway 27. We docked at stand 31 by 1428hrs. Since we were closer to the exit, we decided to get off quickly - we were outside by 1431hrs. The tarmac coach dropped us at the terminal by 1439hrs. It took a very long time to get our bags - they came only by 1449hrs. We got out of the terminal in another 2 minutes - we wanted to have our lunch - but we did not want to fall for the overpriced food at the airport. We headed to the airport cafeteria instead - and had light lunch, before hiring an Uber to return home! The ninth flight on AirAsia India, and first on VT-CCU. The crew were great as usual - not excellent though. The aircraft was clean, and in fairly good shape - but not upto the standards of the LCC market leader. The flight departed on time, and took me efficiently from point A to B. The smell from the oven was very inviting - I am sad about not booking something to eat! 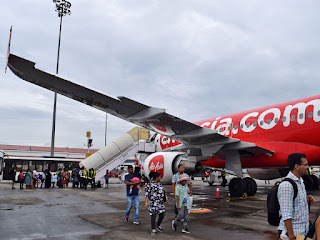 I loved the flight, and look forward to more on AirAsia India.